A good friend and fellow aviation photographer Paul Carter captured the Navy's new floating sea base right as it left Vigor Marine in Portland Oregon. The ship was receiving the retrofits needed for it to become a giant floating logistical node that will support a large amphibious force under austere basing conditions. Classified as a Mobile Landing Platform, this 35,000 ton (displacement) converted mega-tanker design will be able to semi-submerge its hull so that no less than three Landing Craft Air Cushion (LCAC) hovercrafts at a time can haul cargo on and off. With individual LCAC "lanes," this mobile pier can move an eye watering amount of cargo and be off to go do it again at another location. Cargo can consist of everything from troops to M1 Abrams main battle tanks, and everything in-between. While LCACs are coming and going from her starboard side, she can be accepting more cargo from her port side. In this sense the ship is really a mobile pier and many classes of ships, from small craft to the fast moving HSV-2 Swift catamaran to large roll on/roll off logistical ships, can tie up to her and transfer thousands of tons of supplies and material via the her built in cargo ramp. At the bottom of this ramp, and next to the LCAC lanes, there is a large vehicle and cargo deck where material can be staged after before being sent away via hovercraft. This vehicle and cargo deck area could also work as a large landing deck that can accommodate any helicopter in the American inventory, from the mighty CH-53E Super Stallion to the UH-1Y Venom. When operating aviation assets the ship can carry a large volume of jet fuel and work as a forward arming and refueling point for rotary winged assets. The 765 foot long Montford Point, the first of four ships in her class, and the converted test platform that came before her, are the culmination of a very clear change in strategy from relying on large fixed bases for logistical and operational support, to being able to self-deploy a floating logistics "node" that will work very much as a port in its own right. This is all part of the Pentagon and Obama Administration's attempt to militarily and geopolitically "pivot toward the pacific," and away from counterinsurgency operations in the Middle East. Part of this pivot is being able to operate in impermissible environments, where access to a whole geographical region may be denied via the enemy's weaponry and/or nearby basing may be denied by normally friendly countries due to political sensitivities. The USNS Montford Point, which could act as its own modular port, is a key centerpiece to overcoming an enemy's anti-access/area-denial strategy and would be a major multi-role force multiplier for any American flotilla or amphibious force operating in her area of operations. Sea basing operations are nothing new as they have been used in Vietnam, the Persian Gulf in the 1980's and the USS Ponce has been operating in such a function near the Straits of Hormuz for a couple years now. The special operations community is even currently configuring their own futuristic sea base that will be capable of supporting myriad maritime and aviation capabilities. Still, the sheer size of the Montford Point Class, their mobility and the modular re-configurable potential they represent, is unprecedented for such a sea basing capability. Two of the USNS Montford Point's sister ships will be configured to act as sea bases primarily for operational, not logistical support. The missions these unique vessels will actively support are mine clearing, anti-piracy, special forces support, maritime security and disaster relief operations. The main difference in these two ship's design will be a large elevated flight deck that will be capable of supporting relatively large forces of heavy and light helicopters. There will also be hangar facilities and expanded jet fuel storage capacity to ensure continuous flight operations even in very remote areas of the world. These ships will still be able to provide some "deployable pier" capabilities, but the LCAC lanes and large vehicle/cargo staging area will be omitted. 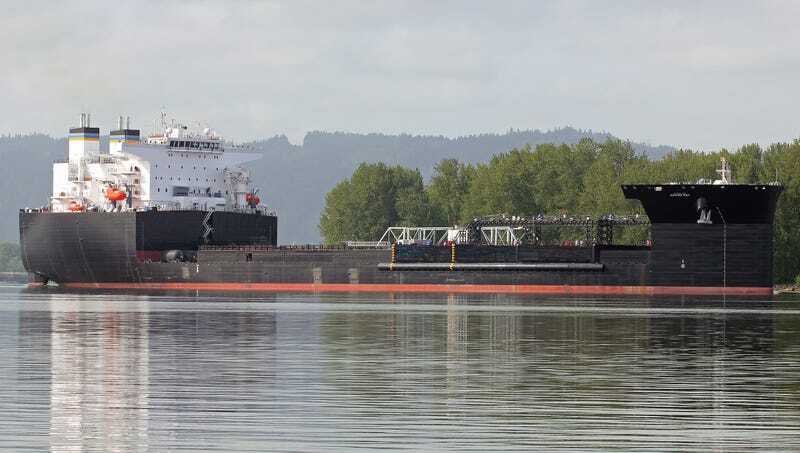 Because the Montford Point is basically a semi-submersible cargo ship, once all her deck gear is stripped away she can also act as a transport dock for very large ships or ocean platforms. Although such a capability has been around for decades, we saw its use to a spectacular degree when the MV Blue Marlin transported the Arleigh Burke Class Destoryer USS Cole from the coast of Yemen back to America with a giant hole blown in her hull. So there you have it! The USNS Montford Point, making its missionized debut quietly on Portland's Willamette River. A ship that is a clear symbol of America's new focus on operating in denied areas against serious peer-state competitors and the deployable logistics node that Navy has been salivating over for years. Photo credit: First shot and third shot via Paul Carter, the rest via the USN.